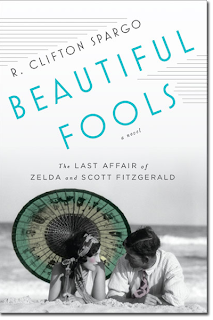 R. Clifton Spargo, a cultural critic and fiction writer, is the author of the new novel Beautiful Fools: The Last Affair of Zelda and Scott Fitzgerald. His writing has been featured in a number of publications, including The Antioch Review, Glimmer Train, and Newcity. He is based in Chicago. Q: Why did you decide to focus on this particular period in the lives of Scott and Zelda Fitzgerald? A: One of the results — somewhat unfortunate, as I see it — of the recent Zelda and Scott revival, spurred by films from Woody Allen’s Midnight in Paris to Baz Luhrmann’s The Great Gatsby, is that we’ve focused, yet again, on the young, high-society, recklessly hard-living couple who stand for the roaring ‘20s in our collective imagination. Scott and Zelda, they signify all that is self-absorbed and yet somehow glamorous, beautiful and yet altogether foolish. It’s a story Scott himself started to spin about the excesses of the 1920s, well before the Wall Street Crash of October 1929. Americans, he warned as early as 1926, were going to pay a heavy price for all the fun they were having. In Beautiful Fools, I wanted to investigate two famous people after their “fifteen minutes” are up. Granted, Scott and Zelda would get more than fifteen minutes in the long run. They’ve become the stuff of legend in American literature and international pop culture. But, originally, their fame was relatively short-lived; the fall from grandeur, cruel and devastating. By the mid 1930s they were forgotten. She, no longer the “it girl” muse, suffered several mental breakdowns starting in early 1930, spending the rest of her life in and out of institutions, living most of the next decade in severe duress. He, no longer the voice of a generation or the “Jazz Age,” suffered from depression, desperate alcoholic binges, and a precipitously declining literary star. What they endured was, in some sense, their own personal great depression. The analogy is almost too eerie — Zelda was the age of the century, and broke down only months after the Wall Street Crash. Scott served up fictional accounts of their story — Babylon Revisited perhaps the finest among this sort — in which he treated their tragic fall from grace as a kind of punishment tale. So I decided to enter into their lives in the 1930s — a prologue set in 1932 in the midst of Zelda’s second breakdown; the rest of my novel set in the spring of 1939, a year and half before Scott’s death. On the surface things appear to be as bleak as they’ve ever been for Zelda and Scott. Beautiful Fools is a tragic tale, no shying away from that tag — their lives assume tragic form in the 1930s, and as a writer I’m highly committed (though hardly exclusively) to the genre of tragedy. As I understand the genre — and what I’ve tried to do with it in Beautiful Fools — “tragedy” is about the arbitrariness of misfortune, about external circumstances that conspire with our own mistakes, about sufferings that speak to us in our real and potential vulnerabilities. Tragedy is about the gap between what we desire in the world and what we’re able to achieve. Tragic heroes, such as Fitzgerald’s own Gatsby, may often be failed idealists, but that doesn’t mean they’re wrong for having tried to expand the horizons of their humanity and ours. Q: What accounts for people’s continuing fascination with the Fitzgeralds? A: Many things really. For starters, there’s the ongoing attempt to do justice to Zelda in her own right, not just as the whimsical, beautiful, and reputedly unbalanced famous wife of a great author. Much of that effort started with Nancy Milford’s magnificent 1970 biography Zelda, and the fascination has ebbed and flowed for decades as so many things do in American culture. Still, second-wave feminism took up Zelda’s cause as a creative personality and force, as frustrated artist, as someone who was more than just some albatross on her husband’s neck (the view popularized by Ernest Hemingway), but who was a victim of her own tragic fate as a true personage. Milford helped us to see Zelda’s story as testimony to the historical restraints placed on women as citizens and as makers of culture. And so much of the late, late love story of the Fitzgeralds, as I tell it, depends on a dauntless and endlessly creative Zelda, whose efforts to revive a love affair with her husband continued to the very end, even after all the internally and externally motivated adversities their love had weathered. In some circles, the mythic force of Zelda’s beguiling if wildly unpredictable personality — perpetuated in part by Scott’s diverse portraits of Zelda-like women in his fiction — accounts for the Fitzgeralds’ allure. Glenn Frey wrote the Eagles’ famous 1970s hit “Witchy Woman,” or so the story goes, after reading Milford’s biography. And yet, when he sings of a woman “who drove herself to madness with a silver spoon,” he’s imagining himself as a Scott Fitzgerald-like man spellbound by seductive charms that are indistinguishable from madness. In short, “Witchy Woman” owes as much to the lore of Zelda perpetuated by Hemingway and John Dos Passos — each of whom swore, separately, to perceiving Zelda as “off” on first meeting her — as to the Milford biography. That’s one way of viewing Zelda and Scott’s story: There but for the grace of God go I. By embodying our reckless or illicit desires, they exorcize our capacity for excess. It’s my sense that there’s a new cultural urgency for us in this kind of story, as we’ve been living in the greatest recession economy since the Great Depression. But this fascination with excess and ruin isn’t a recent phenomenon. It informs, for example, the way we talk about rock stars from Elvis to Kurt Cobain to Amy Winehouse. We’re fascinated and appalled by creativity pushed to the extreme of self-indulgence and self-destruction. We stand and admire with stunned ambivalence, then step back from it all. As a storyteller, though, it’s my job to break down — for a little while at least — our sense of being at a safe distance from the hurt and wreckage. I’m fascinated by the nature and extent of Zelda’s mental illness, and I want my reader to experience her symptoms as she might have experienced them. Similarly, I want to bring my reader as close as I can to Scott’s darkest hours so as to experience the toll his alcoholism and depression must have taken on Zelda, even as I also show his resilience, the graceful capacity for kindness he always retained. My favorite book of modern psychology is Freud’s The Psychopathology of Everyday Life, with its basic premise that everything Freud learned about those suffering from debilitating mental illnesses could be applied to himself and the rest of so-called ordinary folks as a mirror reflecting everyday neuroses in behavior. Freud believed that our being was inseparable from the simple psychopathologies through which we experience the world. Even something as simple as forgetting a neighbor’s name (one we remembered only yesterday) might hint at the mind’s strange workings, suggesting the ongoing struggle between retaining and losing our past selves that we undertake at every minute of every day. So, again for me, Beautiful Fools isn’t about the distance we create as readers between ourselves and Zelda and Scott. It’s about what we can see of – and learn about — ourselves in their brilliant passion and awful demise. Q: How did you blend the historical with the fictional as you wrote Beautiful Fools? What combination of history and fiction did you feel was right for the story you were telling? And this novel is the story of that last meeting: on a holiday in Cuba, in April of 1939, about which biographers or historians know almost nothing. History provides the frame, then, and all of the novelistic detail has to be researched thoroughly and fictionalized with verisimilitude in the fashion of strong historical fiction. But there’s space too for the imagination in the midst of the historical facts. And I was drawn to the scenario as much as to anything else — the idea of a no-longer-famous couple getting one last chance to salvage their passionate if highly tumultuous love affair, all the while not knowing it was to be their last chance. Just that scenario alone made this a story I had to tell. I’ve long been fascinated by F. Scott Fitzgerald the writer, but the novel is the result of my becoming again troubled and then lured by this “lost chapter” in a great love affair. You’re probably familiar with the famous cliché “write what you know,” attributed to Sherwood Anderson, as advice to William Faulkner; and, it’s true, every writer draws heavily and intimately on what he or she knows. But as readers of fiction we love to read for what we don’t know. The best advice I’ve ever heard given to authors is to write the book you would want to read. So Beautiful Fools is a narrative that takes shape from what we simply couldn’t know, factually, about Zelda and Scott. What I could invent – as informed by months and months turning into years of research on the Fitzgeralds, on Cuba, on fashion and lingo and psychology and cockfights from the 1920s and the 1930s — had to stand imaginatively in the space of all that must remain a mystery to biographers and historians. Q: In an article for The Atlantic, you write that you were "raiding a scene from Fitzgerald’s Gatsby and the real-life incident behind it for my title Beautiful Fools." Can you explain why you chose to do that? A: It’s a slightly ironical title, in that it refers to Scott’s practice of taking notes on his own life and pilfering his wife’s phrases in the service of his fiction. And now here I am, in Beautiful Fools, speculating on a missing chapter from the Fitzgeralds’ lives, this trip to Cuba in 1939 of which there’s almost no record. Zelda, still dazed from the ether, isn’t quite making sense when she coins that phrase. She’s not in performance mode, like Daisy Buchanan, offering some staged remembrance of her witticism (though both Zelda and Scott were well known for staging stories about themselves). Zelda responds intuitively to the news, not yet understanding what she means, and on the spur of the moment she makes that odd pairing of “beautiful” and “fool” that gives rise to my title. Scott heard the beauty and strangeness in the line, but I have to admit I like Zelda’s original phrasing even better than the words he attributes to Daisy in The Great Gatsby. With regard to the notion of “beautiful fools,” I should say that, as with any phrase or witticism, it takes on new meanings in new contexts. So, as I hear it — and I think this is consistent with Fitzgerald’s own Romantic strain, which I do share — “beautiful fools” are idealists, people who stand on hopes and dreams even past the point at which they’re likely to be fulfilled. Gatsby is the true “beautiful fool” of Fitzgerald’s most famous work. And in my novel, of course, Zelda and Scott become the beautiful fools, living on the borrowed time of past glory, yet still believing that adversities might be overcome — they were still so relatively young! — and that the world might again prove yielding and full of promise. So they head for Cuba to see what can happen. One piece of lore that I incorporate into my novel has Scott leaving a note on his desk at M-G-M, which reports, simply, “Gone to Cuba.” And Cuba and the cast of characters from Cuba and war-torn Europe (including a Spanish Republican refugee from the Spanish Civil War and his French wife) drive the action of the novel as much as Zelda and Scott do. Which is to say, much of the drama in the novel follows from random events and characters, as if fate is chasing down Zelda and Scott’s demons for them. On that level Cuba — as place so often functions in fiction — serves almost as a character. There’s high drama on the second night in Havana after Scott and Zelda are escorted by a local Cubano named Matéo Cardoña, a key character in the novel, to a bar that plays Cuban son music, an Afro-percussive genre of music that might be understood as a kind of step-cousin to jazz. Then, on the resort beaches of Varadero, there’s an erotically infused flirtation between the Fitzgeralds and a Spanish refugee and the French wife/cousin who rescued him from a refugee camp. And, if that’s not enough for those in search of action, toward the end of the novel there’s a cockfight that yields plenty of violence inside and outside the ring. In short, I create a chain of events for this week-long holiday that echoes, as it were, the drama of Scott and Zelda’s adventurous, always surprising lives. In all candor, I’d say that I focus on the late 1930s Fitzgeralds, on holiday in Cuba, because at that point in time they’re most intriguing to me. As they bear up against the hard knocks, as they challenge their circumstances with their relentless, sometimes self-delusional hope — well, for my money, that’s when Zelda and Scott put the love story in overdrive. As it gets truly messy, the story becomes most compelling to me. Ultimately, my rendering of the Fitzgeralds takes the form an adult love story about a couple that usually typifies all that is “young” and “youthful” for our youth-obsessed American pop culture. 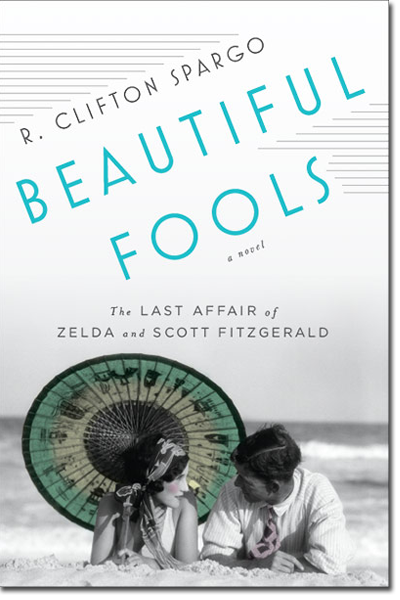 But Beautiful Fools tells the tale of Zelda and Scott after the crash in their relationship, and depicts them, for all their idiosyncrasies and flaws, as still devoted to each other. In the day to day, they fight off fate, denying or beating back the increasingly inevitable result of not ending up together, and somehow the love — in whatever strangely altered form it must assume — survives.